Welcome to beautiful Northern Virginia. We are located near such landmarks as Monticello, Montpelier, Mt. Vernon, Skyline Drive, Luray Caverns, and only 2 hours to Historic Colonial Williamsburg or Washington, DC. Many Civil War Battlefields, wineries, and Antique Shops are just minuets away. Great Mountain hiking can be found at nearby Old Rag Mountain. 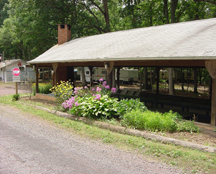 Our pavilion is great for social cookouts, bingo or you may rather just relax by the fishing pond. 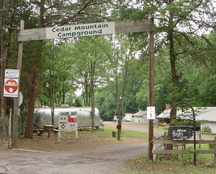 We offer a full range to campers, from rugged tent sites to full hook-ups including Pull-Thru sites for those big rigs. Come and visit us and enjoy the wonderful Virginia Outdoors. Excellent golf and tennis venues are available throughout the area. 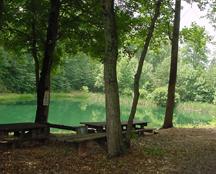 Lake Pelham and the 100+ acre Mountain Run Lake Park provide excellent locations for picnicking and boating. Scenic canoeing is available along the Rappahannock River, which flows from the eastern slope of the Blue Ridge Mountains to the Chesapeake Bay. Culpeper is also home to Commonwealth Park, one of the state's largest equestrian facilities, hosting a variety of horse shows, rodeos, and special events. All throughout the year, Culpeper hosts a popular schedule of festivals and special events including April's Historic Homes and Gardens Week, the summer's Bluemont Concert Series, May's Culpeper Crafts Show, June's CulpeperFest, and old-fashioned Fourth of July Festival, October's Harvest Days Farm Tour and Airfest, fall's OctoberFest, and the October Wine Harvest Festival. And, of course, excellent dining and lodging accommodations are available in our may fine restaurants, motels, and Bed & Breakfasts.